Have I scheduled my child’s visit at the right age? We do everything we can to prevent tooth decay for every child, any age. 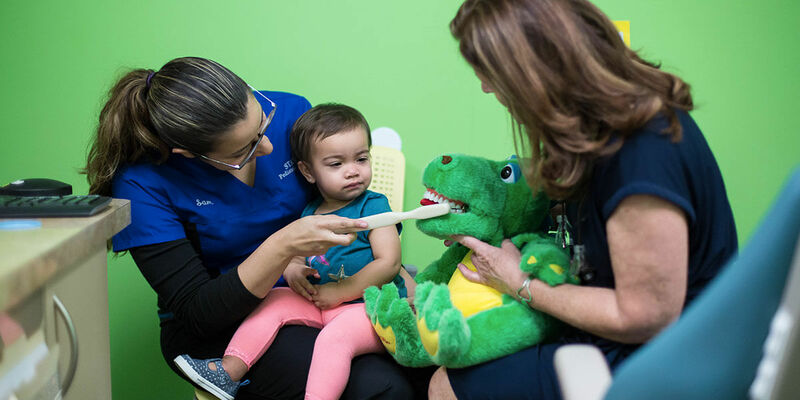 The American Academy of Pediatric Dentistry recommends that children have their first dental visit by their first birthday. If your child is starting dental care later than age one, don’t worry. While our goal is to start early to help your child be cavity free for life, we see children right through adolescence, and even a few young adults. Your teenager will fit right in. How should I prepare, if this is my preschooler’s first dental visit? At the first visit, your child will have a chance to become acquainted with us. He or she can ride in the chair, see how the water squirts, and more. He or she will have a comprehensive dental exam and may have x-ray pictures taken. During the visit, you are welcome to stay with your child the whole time or relax in our reception area. If your child seems nervous about the visit, you can say reassuringly that you’ll be together the whole time. We can even treat a small child while he or she sits on your lap. We will do our best to explain every step of the visit in language your child can understand. During the visit, you should also feel free to ask any questions that you may have. What if my child has been seen by another dentist? Please request a record release form and send it to your child’s previous dentist as soon as possible, so that we will have all the information we need, especially x-rays. If you have x-rays from a previous dental visit, we may be able to take fewer during your child’s visit with us. What if my child is anxious or has special needs? Feel free to call our office to schedule a free “get acquainted” tour for your child.